By Ahmed Bilal on December 15th, 2010. 1) You’ve been nominated for Best Football Journalist, chosen by both fans and industry experts, how does it feel? Surprising. It’s very nice to think that people have read my stuff, engaged with it and enjoyed it. I hope it’s managed to work from both sides, as well: by bringing Spanish football to an English-speaking audience outside of Spain but also having enough to say to interest Spaniards. There are times when it’s hard and tiring, so it’s really nice to think it’s worthwhile. 2) What kind of year has 2010 been for Sid Lowe? A long but fascinating one. The World Cup was extraordinary of course and felt like a reward for a truly special generation of Spanish players. There have been arguments about their style (outside Spain, at least) but I think they were entirely worthy winners and it has been very interesting, and often gratifying, to follow their progress. Barcelona have, I think, altered the parametres of football, and that in turn has led to a response from Real Madrid which is colossal – and always hugely interesting. These are gigantic clubs that have such huge significance that they are always throwing up great stories. On a personal note, 2010 also saw my book published at last. I don’t expect anyone to read it — it’s on Spain’s political right wing in the 1930s, after all — but it was pleasing that it actually happened. 3) What do you think has been the key factor in your success? I honestly don’t know, you would have to ask the people who read my work to reply to that. But there are some things I am conscious of: trying to tell good stories, trying to find out and transmit something different, trying to do something different (whether that’s style or focus or argument), trying to give a feel of people’s reactions and experiences, of what football is beyond the obvious. Sometimes it goes wrong, but I always try to avoid doing the obvious and in an obvious way. I try very hard to say something, to actually tell the readers something, even if it’s just a curious anecdote. It’s vital, I think not only to tell people what, who and where but why and how: I am fascinated by process and reasons: so and so team are struggling. Sure, but why?! Another team are racking up the goals, but how?! Everyone sided with Preciado over Mourinho in a recent battle, for example: I tried to explain why. I try to make sure arguments are not just based on assertion but evidence. Another thing: I try to enjoy football too of course and express the fun, but without that removing a critical or analytical edge and I would always prefer to denounce what I don’t like than let it slide. My personal obsession: making sure that it’s not just about Madrid and Barcelona. (Which is not easy to do). There are other teams in Spain: they deserve much more respect. 4) If you were casting a vote for your any of your fellow nominees, who would it be? I could vote for all of them; they are fantastic writers. I do admit though that I was pleased to see Scott Murray’s name on the list. He is a brilliantly inventive, often acidic, often touching, writer. And very, very funny. 5) What’s next for Sid Lowe? More of the same, I imagine. I just hope Spanish football doesn’t get eaten by Madrid and Barcelona. I hope it can survive and break away from the risk of monotony. I use a lot of statistics. Not so much as the basis of arguments as a way of supporting them. I love the way that can reinforce what you think or totally destroy what you imagined to be true. They have to be handled well, of course, but I like them a lot. And I agree with Castrol’s Ranking right now. There can be absolutely no doubt at all in my mind that Leo Messi is the best player in the world. Maybe even one of the best ever. 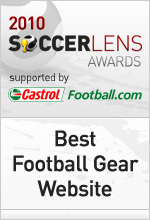 Back to the main 2010 Soccerlens Awards nominee interviews page.